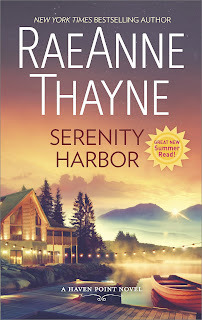 Katrina Bailey has returned to Haven Point, Idaho, for the wedding of her sister Wyn and Cade Emmett (Riverbend Road), but she is not the party girl who left her job as an elementary school teacher to accompany a boyfriend to South America. Her experiences teaching English and volunteering at an orphanage in Colombia were transformative. She plans to return to Colombia in a month to complete her adoption of Gabriella, a special-needs child whom Kat met at the orphanage. Gabi, not quite four, won Kat’s heart with her sweetness and fragility, and Kat’s focus now is on keeping her promise to return for Gabi. When a new acquaintance, Bowie Callahan, offers her a job as temporary nanny to his young brother who has been diagnosed with autism, Kat barely hesitates before turning him down. She thinks her time should be devoted to her family. Bowie is the new research and development director for Caine Tech. A self-made man who has battled his way from his beginnings as the son of a teenage mother addicted to alcohol, drugs, and men to his current wealth and respected position, Bowie has only recently learned of the existence of Milo, a half-brother more than twenty-five years younger. He could have turned down guardianship, but he chose to accept responsibility for the brother whose life so far has mirrored Bowie’s childhood. However, with the best intentions, he is at a loss when it comes to dealing with six-year-old Milo. He has hired a nanny who is an expert at caring for autistic children, but he is desperate to find a caregiver for Milo until she arrives in three weeks. When Katrina Bailey demonstrates an intuitive understanding of Milo and prevents a grocery-store meltdown, she seems perfect for the job. Bowie is willing to pay her an exorbitant salary to take the three-week position. When Gabi’s adoption requires more money, Katrina accepts Bowie’s offer. She soon finds herself falling for her young charge and his older brother, “a man who smelled like sin and kissed like salvation.” But Kat is always conscious that Gabi is depending on her, and regardless of her feelings, she cannot allow Bowie and Milo to distract her. Kat’s presence has changed the lives of both Callahan brothers and Bowie is worried about how empty their lives will be without her. With conflicting needs, can Kat and Bowie find their way to an HEA? Serenity Harbor is the sixth book in Thayne’s Haven Point series, and it has her trademark qualities of heartwarming small-town community and ordinary, imperfect characters whose stories reveal their extraordinariness. On the surface, Kat with her Haven Point roots and loving family seems to have nothing in common with Bowie and his troubled childhood, but they both have known the sting of being “different” and the resulting uncertainty that causes them to question their own worth. When their mutual devotion to Milo is added, the two are perfectly paired. Bowie is a wonderful hero, scarred but valiant and with a generous heart. Kat is a bit too single-minded and unwilling to compromise, but she is overall a likable heroine. And Milo steals the reader’s heart as effortlessly as he steals Kat’s. Although the book can be read as a standalone, fans of the series will enjoy seeing many familiar characters and will doubtless take special delight in being a guest at Wyn and Cade’s wedding. I give Thayne top marks for her consistency. Her name on a book lets me know that I am going to find characters about whom I care, a story in which I can believe, and a setting that feels like home. I found all these things once again in this book. If you are a fan of sweet, small-town contemporary romance, you should be reading RaeAnne Thayne. I love this series. It is on my list to read. I read this book s few weeks ago and really enjoyed it. I love her books!